MYC4 has redefined it’s strategy and budget plans after it was unable to attract new funding from business angels as originally planned. Mads Kjaer, CEO and main shareholder has announced that he will invest 1.4 million Euro (approx. 2.1M US$) into the company in 2010. To reduces costs MYC4’s management has decided to conduct a collective termination of all employees’ contracts on Monday November 30 in order to renegotiate employment with all employees and give them the possibility of deciding what to do in the current situation with a three-month notice period. Some employees have already decided to stay on board, just as the CEO and deputy CEO yesterday had their terminations withdrawn by the Board of Directors, which means that MYC4 will continue under the management of Mads Kjaer and Svend Toettrup. For MYC4 2009 was an extremely difficult year as default rates of the loans of nearly all local providers peaked. Volume of new loans slowed to about a quarter of the high reached in mid-2008 as several providers were paused to evaluate/clear the situation. The conflict with Ebony Capital Ltd., a provider in Kenya, reached new extremes. The legal battle led to a search of Ebony’s premises by the Criminal Investigation Department, Nairobi on Dec. 1st. Furthermore MYC4 placed information adverts in a regional newspaper to encourage borrowers to make repayments on their loans directly to a MYC4 account instead to Ebony Capital Ltd. (picture of newspaper ad). MYC4 even set up an information page directed at Ebony borrowers and linked it on its home page. Given the circumstances 2010 will not be an easy year for MYC4, too. MYC4 has announced that the software development department of MYC4 will move form Kampala, Uganda to Copenhagen, Denmark where the MYC4 headquarter is located. After long and careful consideration, MYC4 has decided to move the software development department from Kampala, Uganda, to the Copenhagen office. The decision is made in close connection with MYC4’s strategic focus on streamlining the organization by focusing all efforts on (a) building a solid and scalable IT platform, (b) creating a strong basis for growth in Africa, and (c) improving the capacity and quality with MYC4’s current Partners. Creating an effective cooperation between Copenhagen and Kampala has proven too complex. The Development Team in Kampala is strong and hardworking, but the current setup does not allow us the close dialog, sharing of ideas, productivity and flexibility that we require. To give an example of the challenges – the internet connection to the Kampala office, which we share with another company, is one of the best available, yet it is only 750 Kbits/second and is expensive (30,000 DKK/month). The overhead costs are too high. Especially “hidden costs” for travel, slower development, waiting time and rework due to difficulties in communication. Initially we saw a lot of benefits from having the software development team located in Africa. However, after having kept trying to improve to set up and make development run flexibly, we must face the fact that the setup is too complex to meet the demands and goals for MYC4’s development. Therefore, over a transition period of 2 months, the Kampala Office will be closed and a software development department established in Copenhagen. At MYC4 it is somewhat awkward for lenders to keep track of their portfolio. Some lenders keep track manually in Excel lists of their loans. 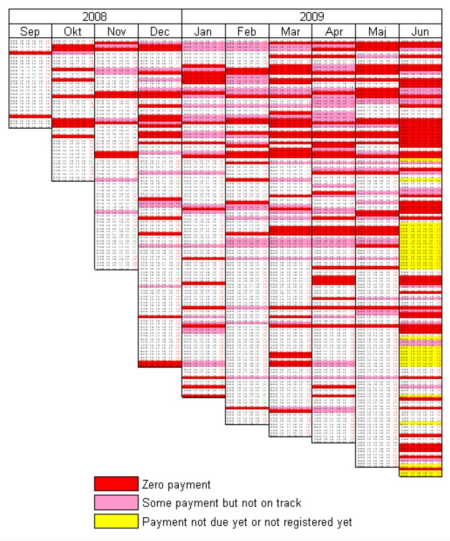 MYC4 lender Bente Pedersen created the following image, which by it’s coloring visualizes that the number of late payments and non-payments on the loan he funded grew over time.